Dimensions: 48,00 mm with crown x 47,00 mm without lugs. Case: Stainless steel polished/satin with 2 ss screws. 3 ss screws and write "Tonino Lamborghini". Glass: Mineral glass sapphire coated. 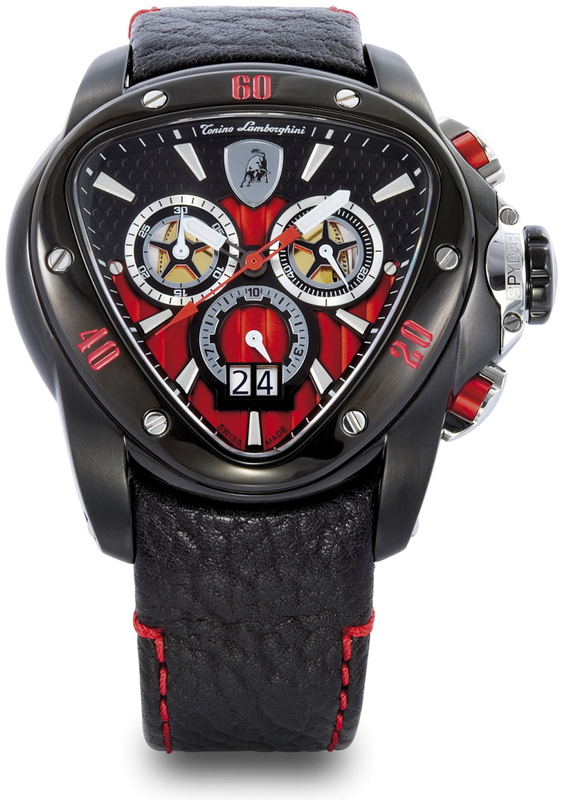 Crown: Stainless steel polished, "Tonino Lamborghini" L on the crown and red enamel. Dial: Ground black with worked surface. 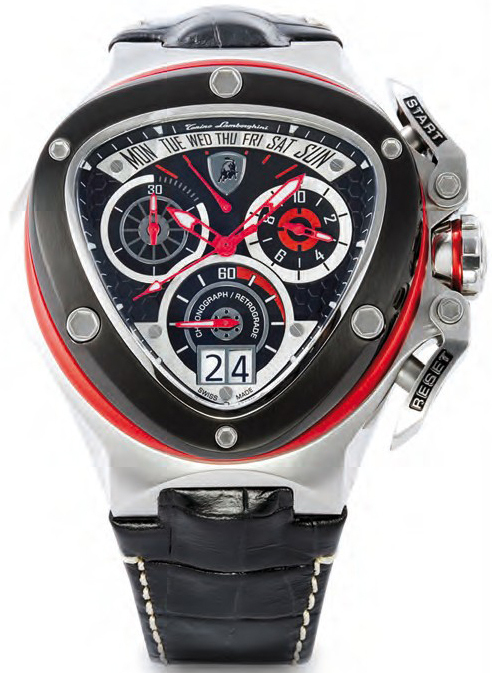 Bague black, white numbers and tachymeter in red. PNP satin brush inserts, index printed in red with SPL. 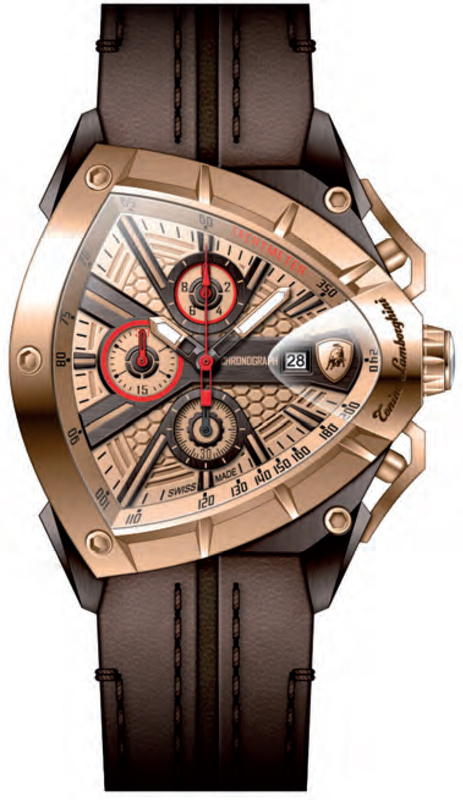 "Tonino Lamborghini" shield at 3H. Hands: White/black/red colour with SPL. Strap: Cow leather black with red line in the center. 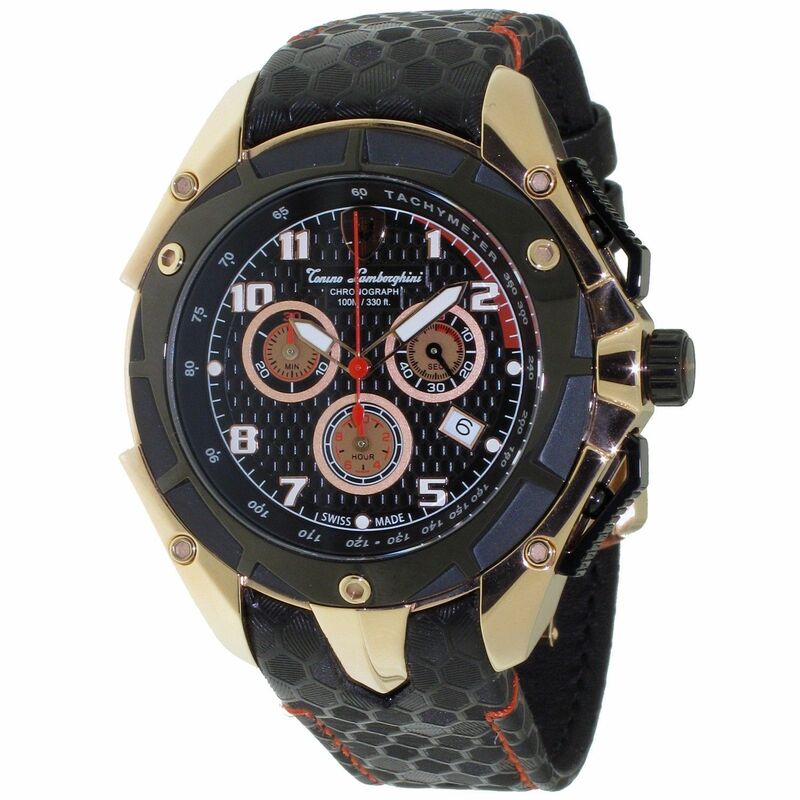 Buckle deployante, "Tonino Lamborghini" engraved and shield 3D. 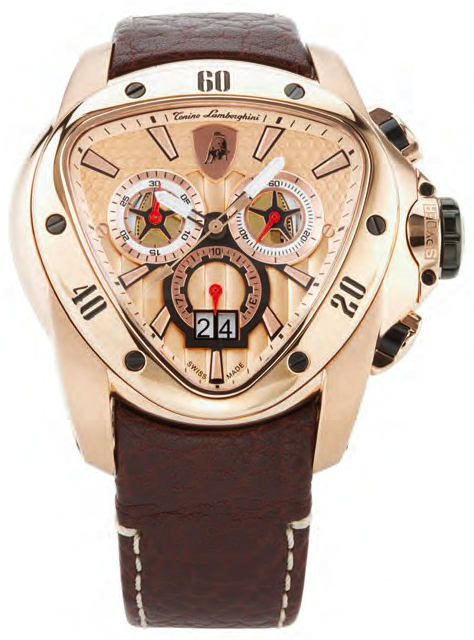 Movement: Ronda RL 3540.D chronograph quartz, SWISS MADE. 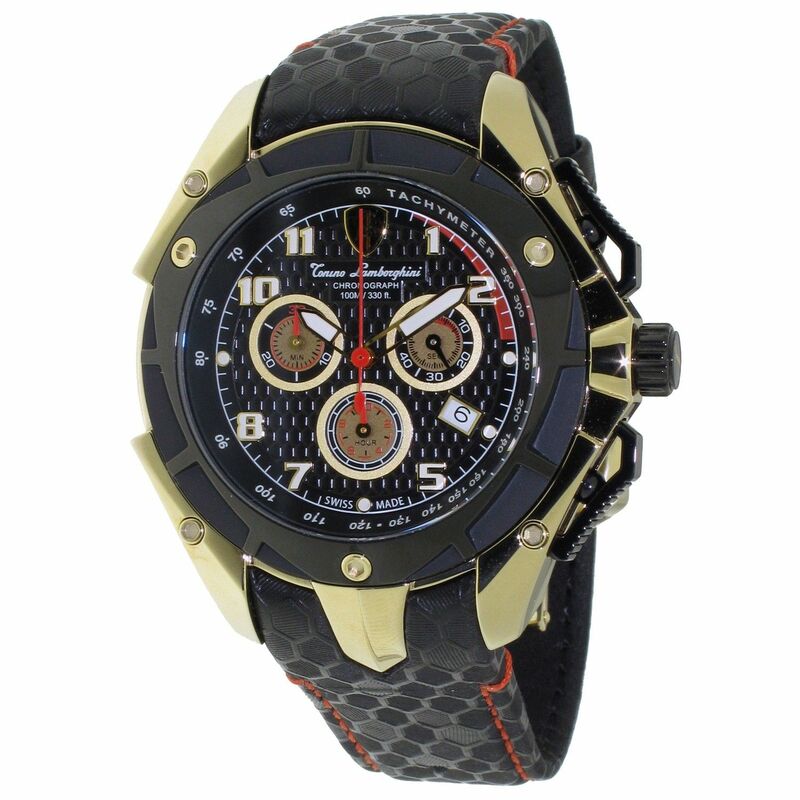 Water resistant: Guarantee 100 meters/330 ft.
Tonino Lamborghini Spyder 1105 is a Quartz chronograph watch, case in polished-satin-finish steel in PVD-Gold, Leather watch strap with black stitching. 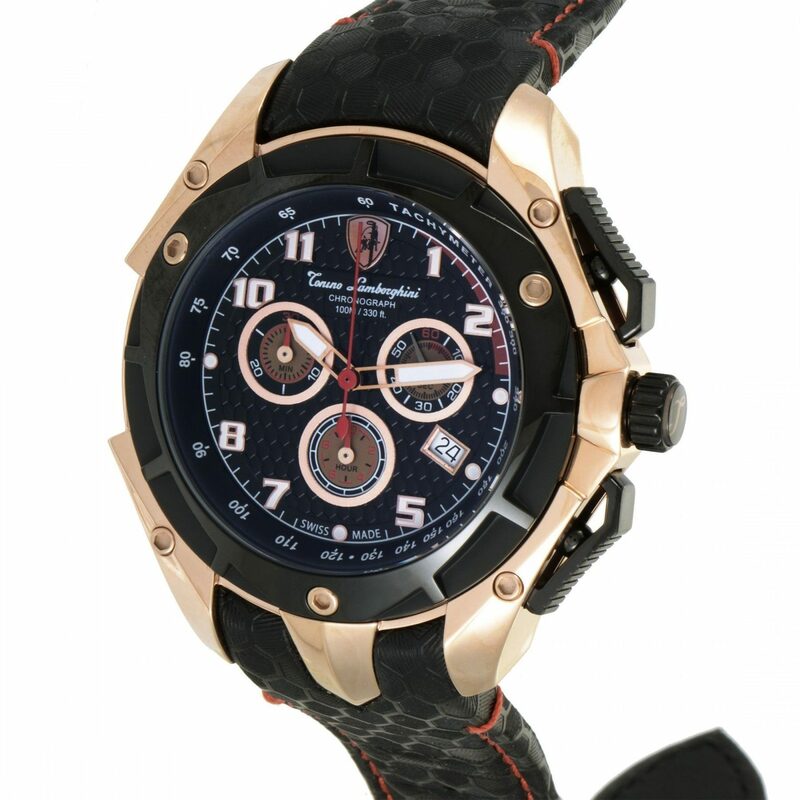 The 1100 Spyder line is a special variant of the iconic model and best seller of the Tonino Lamborghini Swiss Watches collection: the Spyder. Designed in 2007 by the Centro Stile Tonino Lamborghini, the Spyder model was created as a homage to the shield that encloses the famous Miura raging bull in the brand's logo. The shield is the inspiration behind the design of the case, the bezel and many other details for all the Spyder models. 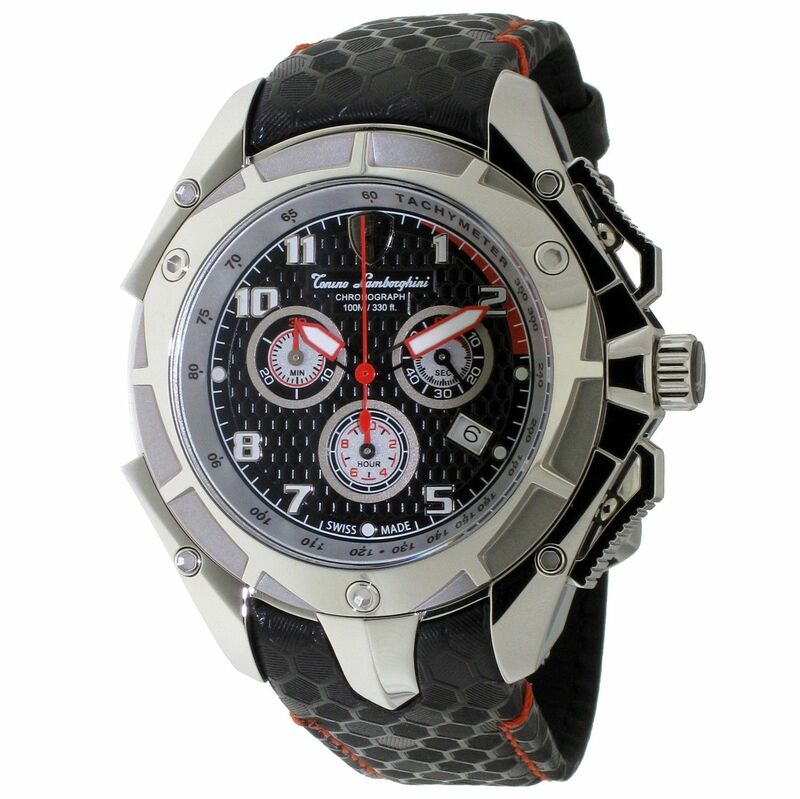 Tonino Lamborghini Spyder 3004 is a Quartz chronograph watch, steel case, bezel with red second component, leather watch strap with black PVD inserts. 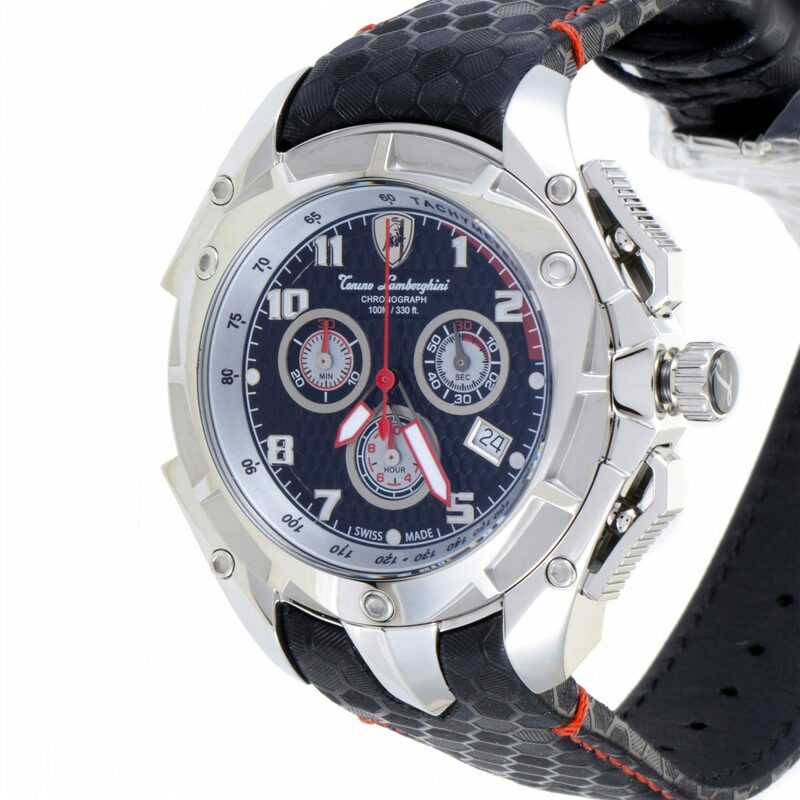 Tonino Lamborghini Spyder 3018 is a Quartz chronograph watch, steel case, bezel with red second component, red crocodile skin pattern leather watch strap. 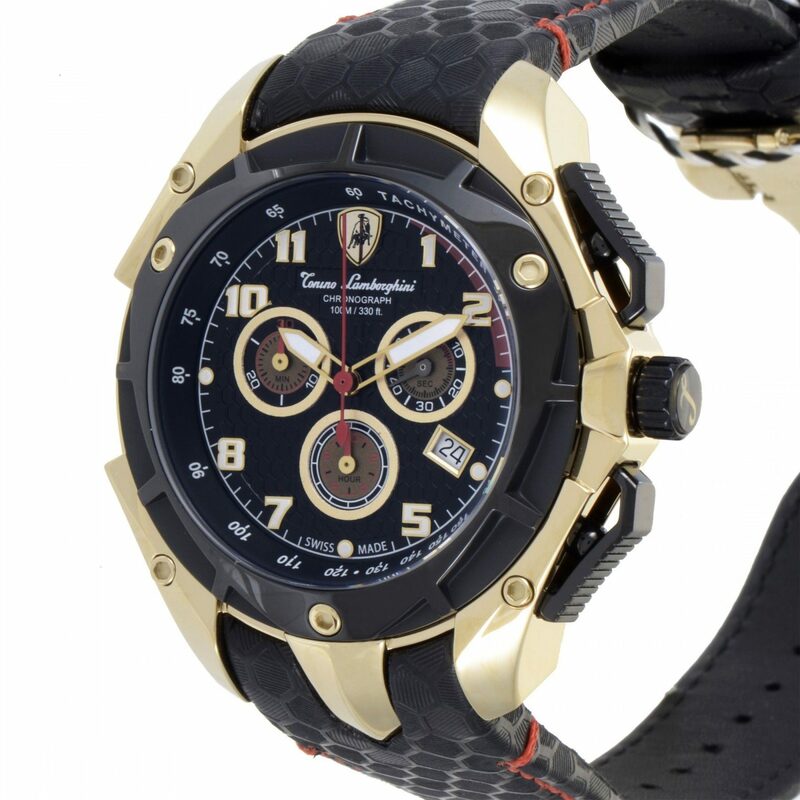 Boasting a strong masculine spirit and a mechanical look that perfectly parallels its superb performance and reliability, this stunning timepiece from Tonino Lamborghini is a classic racing watch both in terms of aesthetics and functions. Beside hours, minutes, seconds and date, the complex black dial which provides legibility through contrast and Superluminova details also features the chronograph function recording elapsed seconds, minutes and hours. Made of polished and satin-finished stainless steel, the round case features sapphire-coated mineral glass and seven decorative screws on lugs and bezel. Housing the Swiss-made Ronda RL 5040.D quartz movement and ensuring 100m water resistance, the watch is worn on the wrist with a black cow leather strap boasting beehive pattern and secured with deployment clasp. 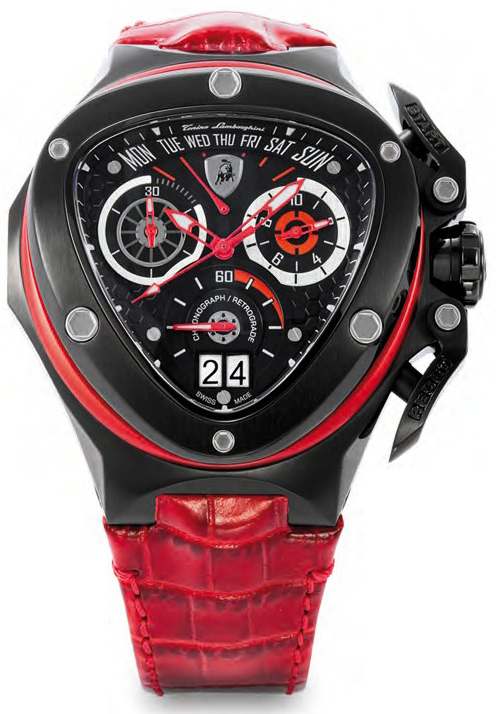 The classic attractive look of a racing watch is given an engaging vintage feel through subtle aesthetic details, paying homage to the long-standing tradition of sublime quality and appealing designs cherished through the Lamborghini family history. Along with hours, minutes, seconds and date, the stunning black dial with bee hive pattern and excellent emphasis through striking colors and luminescent fill also features the chronograph function, allowing you to record elapsed seconds, minutes and hours. 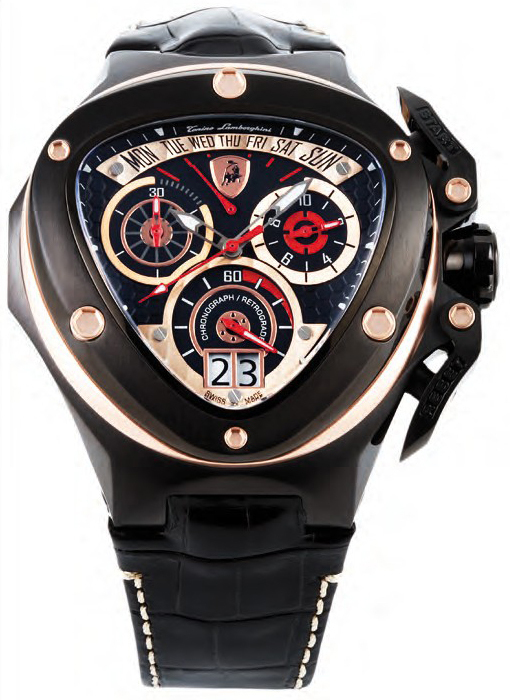 It is framed by black PVD-coated bezel of the polished and satin-finished gold PVD-coated case which features sapphire-coated mineral glass and provides 100m water resistance. Housing the Swiss-made Ronda RL 5040.D quartz movement, the watch is worn on a black cow leather strap textured with beehive pattern and secured on the wrist with a deployment clasp. 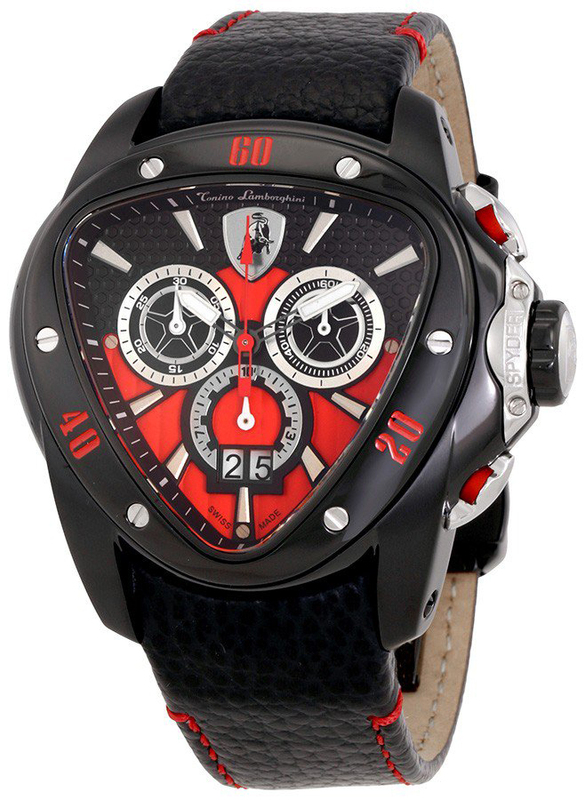 With a robust look fitting for a quintessential racing watch of painstaking precision and superb reliability, this outstanding timepiece from Tonino Lamborghini is a magnificent piece of mechanics with compelling aesthetics, honoring the values that the Lamborghini family stands for. 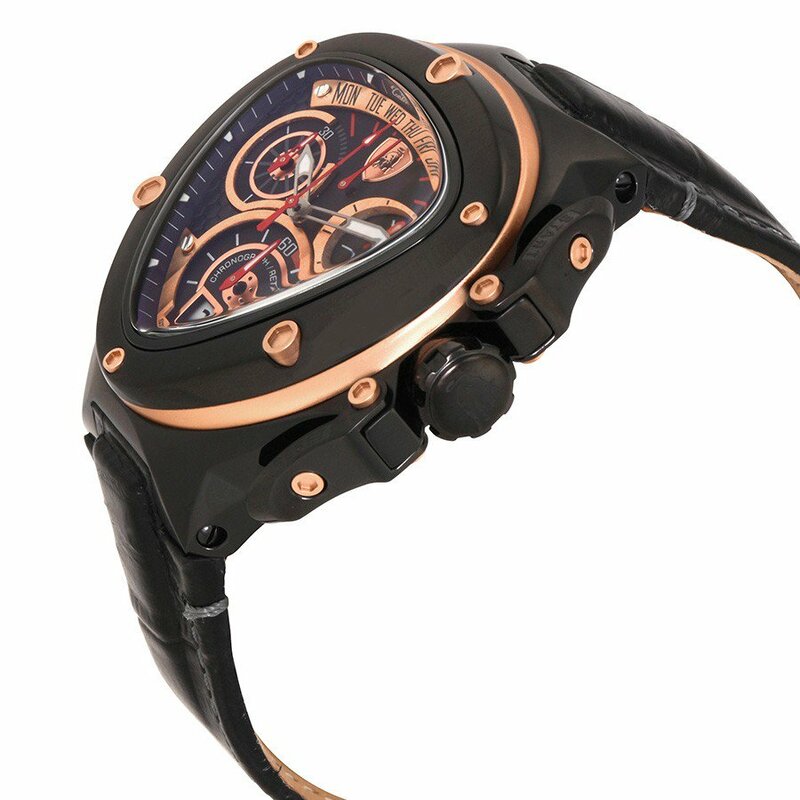 Along with hours, minutes, seconds and date, the stunning black dial with bee hive pattern and excellent emphasis through striking colors and luminescent fill also features the chronograph function, allowing you to record elapsed seconds, minutes and hours. 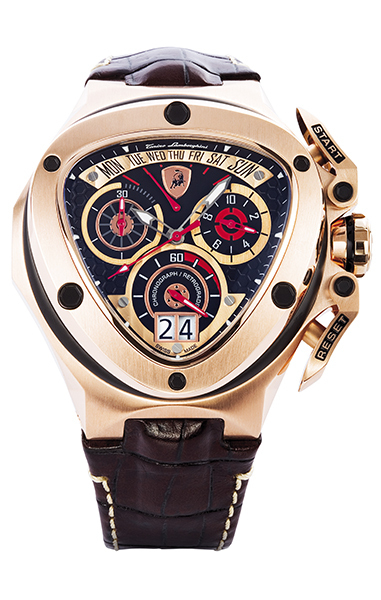 It is framed by black PVD-coated bezel of the polished and satin-finished gold PVD-coated case which features sapphire-coated mineral glass and provides 100m water resistance. Housing the Swiss-made Ronda RL 5040.D quartz movement, the watch is worn on a black cow leather strap textured with beehive pattern and secured on the wrist with a deployment clasp. You were successfully subscribed! Thank you! * Other companies' product names or trademarks are used herein for identification purposes only and belong to their respective owners. Dear customer! Thank you for your order! We will review it shortly and send you a confirmation email containing your order details, and a link to online payment by Credit Card, or an invoice for Bank Transfer. The order will be shipped immediately upon receipt of payment. Once the order is complete, our managers will review it and reserve ordered items in our stock. Then you will receive a confirmation email containing your order details, and a link to online payment by Credit Card, or an invoice for Bank Transfer. The order will be sent immediately upon receipt of payment. This website uses third-party profiling cookies to provide services in line with the preferences you reveal while browsing the Website. By continuing to browse this Website, you consent to the use of these cookies.